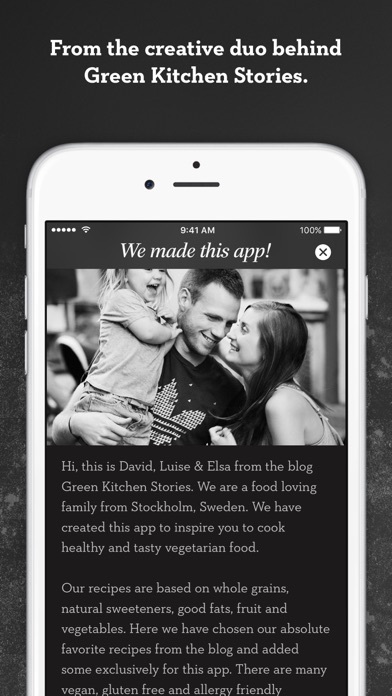 I’ve had the Green Kitchen app for a few years and really enjoy the variety of recipes. It’s very user friendly and beautifully designed. Great recipes, but app is no longer compatible with anything less than iOS 11. Pretty dumb, if you ask me. What possible reason would the developers have for cutting off older devices? There's plenty of them out there. Everything I have made so far is delicious. Definitely recommend. Great app and amazing pics! Who sells food apps without the nutritional value, even basic ones, not listed? Sure, the photos are beautiful and the step by steps seem fine, but I don’t want to waste 15-20 mins on google to guesstimate how many calories/macros are in each dish. Until this is corrected, I’ll stick to using Fit Men Cook for my healthy app recipes. Love this app. The recipes have all been so delicious and have challenged me to combine ingredients I wouldn't normally think to. The app is beautiful and I love that the screen stays on when you are in a recipe so you don't constantly have to put your passcode in to look at the next step. Definitely worth the download!!! Green Kitchen offers delicious, unique and health supporting recipes. 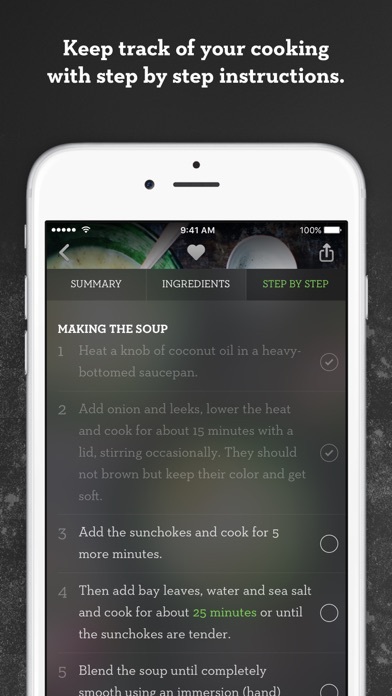 I love the app and look forward to updates with additions to the recipes. If you're looking for easy healthy recipes. You've found the right place. I have enjoyed all the recipes that I have made so far. They are delicious! Thank you, Green Kitchen! I love how this app gives me vegetarian, vegan, and gluten free options all at once so I’m not buying cookbook after cookbook. Excellent resource for healthy, creative, and family friendly vegetarian recipes! The photos are gorgeous, the instructions are easy to follow, and the recipes are always as good as they sound! Perfect resource for those limiting wheat, cow’s milk, and refined sugar. Love it! The Chinese translation of Hot Cashew Chocolate is wrong, it was translated to the same as Moroccan Eggplant & Chickpea Stew. I use the immune recipe all the time. Food taste really good I got my 1 yr and 7yr old to eat more veggies! 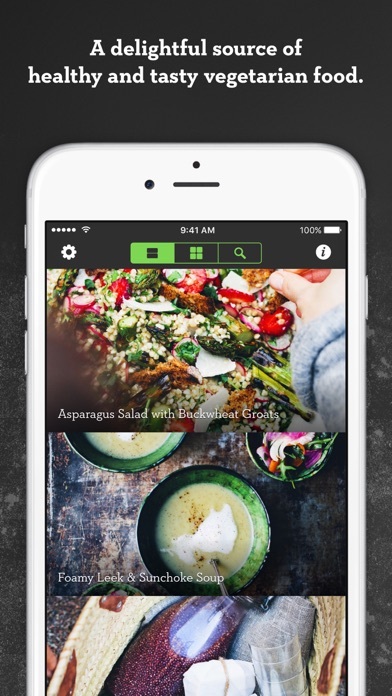 This app has a beautiful layout of Green Kitchen's yummy recipes. I love how the app breaks up the recipes for meals and allows you to save your favorites. Great photos inspire you to start cooking! Gorgeous pictures. Healthy, wholesome, clean ingredients. Everything has been delicious. Simple and not too many ingredients. 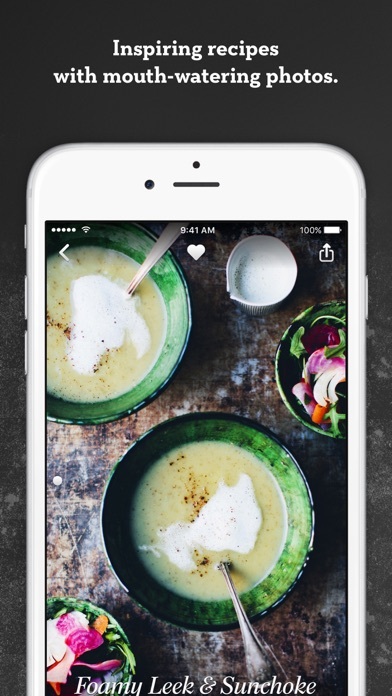 This app is visually beautiful and the recipes are simple and delicious. Very creative as well. My only suggestion is adding a "search" component to the app so that it is easy to find the recipes without scrolling through. This is a beautifully done app with many healthy recipes. We have discovered that the recipes are easy for weeknight meals as well as delicious. Nice interface with ability to text or email shopping list. I hope they continue to add recipes. You can't go wrong with any of Green Kitchen Stories recipes. I've tried so many, and they have all been amazing! Their photos are so beautiful and I love the stories behind each recipe. The app is perfect, I've had it for a few years and I still use it all the time! 100% would recommend to anyone! Easy-to-follow recipes without a huge ingredient list. Love the photos and how clear the recipes are to follow. Best recipe app I've ever been on! So far we have LOVED every recipe!!! LOVEd!!! Love this app and all of the delicious recipes. The flu killer drink helped me survive this winter!!! The recipes are wonderful, even if there aren't a ton to choose from. However, the app is missing lots of basic features. For example, there is no way to search for recipes by keyword or ingredients. So you have to scroll through every recipe to find what you want. There is no nutritional info for recipes. (i.e., protein, carbs, fat, vitamins, etc) Not even calories per serving are listed! How can a recipe app not show calories? So you have no idea which recipes are highest in protein, etc. There is no way to export recipes to Apple's Health app for use in calorie tracking apps like LoseIt or MyFitness Pal. If they could beef up the app with these features, it would be 5 stars. I am not vegan or vegetarian and I love this app. I use it all the time and many of the recipes are kid friendly. Definitely worth the $. We've cooked lots of different dishes from this app and everything has been great! And pretty dern healthy to boot! Always lookin forward to the new recipes to be added. All these recipes are fantastic. Easy, fool proof and delicious! Good app but they had a photo of their in-app purchase option as part of the main app. When i bought it, i saw that i had to pay extra for the recipe from the photo. When i wrote to them about it, i received no reply. That was several months ago. So far I've made three recipes (a salad, entree, and dessert) and they were all a huge hit! Beautiful photos and easy-to-follow instructions! Great app! Love the app. Great, easy recipes. I use the ingredients list while I shop at the grocery store, making shopping and cooking easy. I would love it if you would app more recipes! Figured out how to restore expansion purchases, whew. I got this app as a Starbucks freebie some time ago. I use it often. It has great tasting, healthy vegetarian recipes that are easy to make! Compelled to write a review - Gorgeous app! I recently downloaded this app and love the experience so much that I felt compelled to write a review. The usability of the app coupled with the gorgeous photography and clear, concise language (along with the amazing vegetarian recipes of course!) make it my new favorite app ever. All of this coming from me, a UX Designer myself. Highly recommend. Fantastic recipes, and such a handy app for cooking and grocery shopping. Just wish there were even more recipes, and even more beautiful photos! Beautiful interface. Easy to use. I LOVE the photos, very beautiful and inspires me to want to get in the kitchen and cook. Only complaint is it's spring, almost summer, and the top 10-15 recipes are more winter-time ones; calls for pumpkins and root vegetables which are not very easy, or cheap, to come by in this season. I have tried and true recipes that I use from here and am always looking for new favorites. They are real and simple with equally simple and healthy ingredients. Love! I love this app and I love these recipes. They are delicious and oh so good for you. Beautiful photography and yummy recipes! I'm in love with this app! I have some Vegan and Vegetarian recipe choices. The photos are so awesome inspirational and gorgeous. I beats looking through Pinterest for vegan recipes and seeing NOT vegan recipes between vegan ones. I would rate 5 stars if they had more kid friendly options. By "shopping list" in app description, I assumed they meant I'd be able to "add" recipes to a shopping list, and then send that out. That would be a great and useful feature. Otherwise the app is beautiful. It could use more/better filters (dairy-free, nut-free, etc). 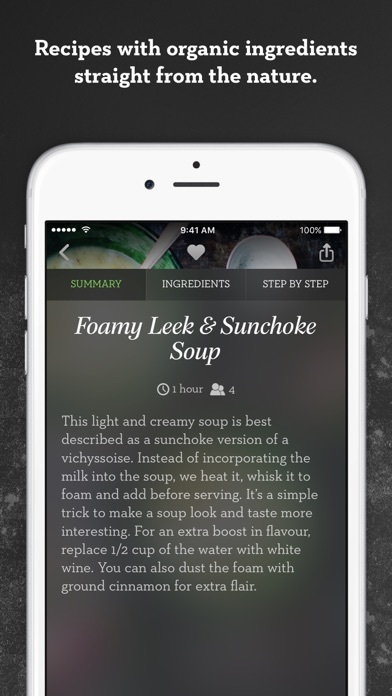 Not sure if the app will continue to populate with more recipes as time goes on, but i like the ones i see so far! I have made a few of the desserts and the delicious butternut squash soup. I appreciate the thoughtfulness of all the selections of recipes that are offered with unlimited options. I love this app. We are eating vegetarian and I find really tasty recipes, easy to follow directions and beautiful photographs. This app really inspires me and helps me eat healthy and more consciously. I love love love this app. I’ve made several of the recipes and they are easy and delicious. I also like that I can search the app for a recipe with a specific ingredient. Beautiful visuals as well.